Ware’s The Woman in Cabin 10 was my first read of 2017, and I was totally blown away and wanted to read her debut. This dark psychological thriller is just as good, if not better! The story moves back and forth between the present and the past. A woman, Leonora (“Nora”) Shaw, wakes up in a hospital but has no recollection of what happened to her. She has been told that she was in an accident. Nora received an email inviting her to attend a bachelorette party for one of her best friends from high school, who she hadn’t seen in ten years. She had lost touch with Clare Cavendish, and the email from a woman named Flo asked Nora if she would come to a cabin in the woods in Northumberland for a weekend away before Clare’s wedding. Nora’s friend, Nina da Souza, also received an invitation and the two made a pact that if one went that the other would go. Well, you know where this is going, right? A remote cabin in the woods away from civilization, where the cell phone reception is spotty...you know it is not going to end well! I loved the creepy setting of the story, and Ware had me literally on the edge of my seat as I was driving and listening to this audiobook. What I love most about Ware’s books are her characters. She has a way of making them seem so real to me, and I feel like I am becoming part of their story. I get caught up in the suspense and excitement. Ware doles out the past in pieces, as she connects it to the present, and I loved listening to the story unravel bit by bit. So, that’s two for two now with loving Ware’s books. She’s a “must read” author for me, and I am on the library’s waiting list for Ware’s The Lying Game which was released in July 2017. 5 stars!! It was superb! I loved it and will likely re-read it in the future. Highly recommended!! I hope you love it as much as I did, Erica! I think this is my favorite of Ruth Ware's books, though they are all very good. 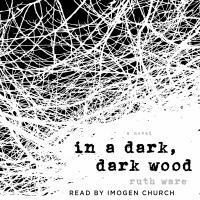 I love Imogen Church and think she is the perfect narrator for these kinds of books. Great review!